NYC, 02/12/2019, 4:30PM. 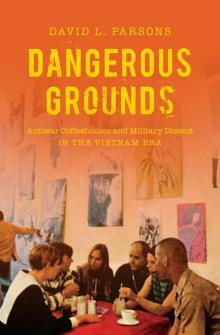 Dangerous Grounds: Antiwar Coffeehouses and Military Dissent in the Vietnam Era. This book explores links between the civilian peace movement and the American military. Author David Parsons is a professor and writer whose work focuses on the political, social, and cultural history of 20th century America. He has taught courses in U.S. history at CUNY and New York University, served as an adviser for a major museum exhibition on the Vietnam War at the New-York Historical Society, and hosts a long-running weekly podcast on history and politics called The Nostalgia Trap.